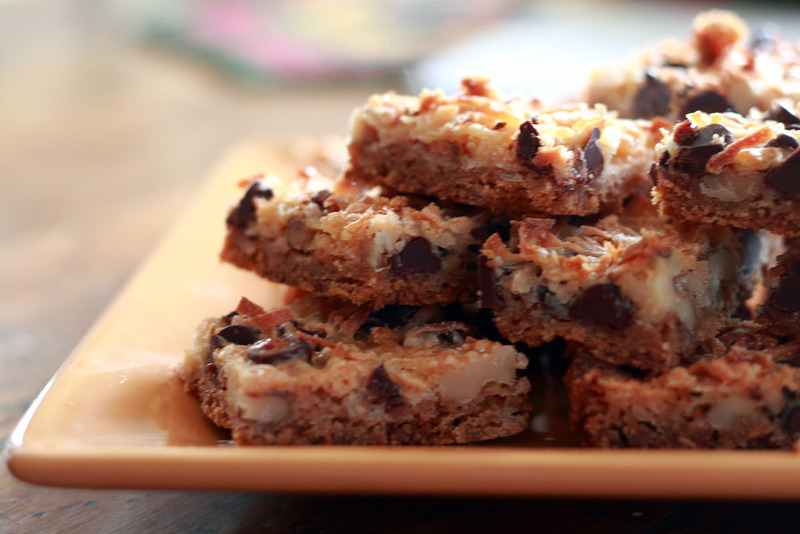 Posting a recipe for Magic Cookie Bars is probably silly because everybody makes these, right? But they are a favorite around here and they are great for a quick, easy dessert. It’s easy to keep the ingredients on hand and when you need to bring something to a party you can throw these together in no time. And they mix up in one pan so you don’t wind up with a sink full of dirty dishes, either. I used to make them and bring them to other places so much that when Hannah was little she once asked me if I could make them “just for us” to eat. Of course I obliged. And now you can make them, too. You don’t have to send them to Hannah, though. You can keep them for your own self. Put a 9 X 13 pan in the oven with the stick of butter while the oven preheats. This melts the butter without using another pan. When the butter is melted take the pan out of the oven and stir in the graham cracker crumbs. Press evenly throughout the pan. Sprinkle nuts over graham cracker crumbs, then chocolate chips, then coconut. Pour sweetened condensed milk evenly over the top. Bake 25 minutes or until lightly browned. Cool and then cut into squares. They look delicious! I’ve never made magic bars, don’t think I’ve ever even tried one that someone else made. Thanks for the recipe! They look yummy. I’m always looking for a treat to bring to my knitting circle. The girls will love these. Those are so yummy. I haven’t made them in ages. Maybe it’s time to whip up a batch. I have all the ingredients on hand too. Mmmmmm, these are a favorite in my house too…now that you’ve posted luscious pictures I think I’m going to have to make some myself! I had forgotten about these. They are rich and delicious! I’ve never heard of these! Perhaps I’ve been under a rock? They look great! At our house these were called Hello Dolly bars…but whatever you call them, they are AWESOME. I can’t stop eating them when they’re in the house. I’m impressed that you can keep the ingredients on hand. If I have a chocolate attack and there’s a bag of chocolate chips anywhere near – they’re history! LOVE these cookies! But at our house, they have 7 layers not just 6. We add a layer of butterscotch bits as well. I love those, but I’ve actually never made them. Yum! I’ve never heard of these before, but now I’ve gotta try them! I love these. I use 1 cup of chocolate chips and 1 cup of butterscotch chips. Now I have the urge to make these! I’ve always loved those. Nummy. I won’t tell you what they were called at vet school bake sales, but they always sold out fast. Nom! my recipe for these babies (once daughter claire’s most favorite) calls them “hello elsie squares” i don’t think i’ve made them since she went off to college. in 2000. since she will be visiting this weekend, (how coincidental!) i should make her some. OMG. With BOTH flavors of chips? Now of course, I’ll have to make some…what nuts do you use? I made these for the first time ever over Christmas. I had to give them away so I would stop eating them. I’ve never had the recipe before! Thank you SOOOOO much! Never heard of them, but they look fab. YUM! What kind of nuts do you use? Can I use peanuts? I have never made these, but I am sure I have eaten them. In the Midwest they, or a slight variation thereof, are called 7-layer bars. Mmmm. For all the muffin baking I do at Thanksgiving, I’m also *required* by several family members to bring along at least one pan of these. Though I, too, use 1 cup semi-sweet chocolate chips and 1 cup butterscotch chips. Mmmm…. I’ve never made that recipe before, but I have always believed that anything involving sweetened condensed milk is wonderful. I might just have to make these this weekend. . . Thanks for the recipe! I purchased the ingredientws this weekend and I will be making them tonite!